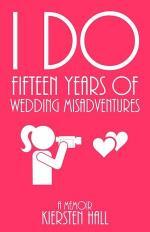 If you enjoy funny, youll love I Do THIS BOOK IS A MUST READ FOR ANYONE WHO IS PLANNING ON GETTING MARRIED OR HAS ALREADY TAKEN THE TRIP DOWN THE AISLE REGARDLESS OF YOUR MARITAL STATUS, I DO IS A FUNNY BOOK 15 YEARS OF MEMORIES FROM 1,400 WEDDINGS AS A PROFESSIONAL VIDEOGRAPHER. THERE ARE PLENTY OF ENTERTAINING STORIES TO SHARE WITH THE READERS CHAPTER TITLES INCLUDE WHERES GRANDMA CAN I GET YOUR AUTOGRAPH WHO BROUGHT THE GUN CALISTHENICS IN FORMAL WEAR THIS BOOK IS A PAGE-TURNER ONCE YOU PICK IT UP, YOU WONT BE ABLE TO PUT IT DOWN UNTIL YOURE DONE COMPLETE BRIDAL PLANNING CHECKLIST INCLUDED AFTER READING THIS BOOK, IM THRILLED THAT MY WEDDING WAS SO AVERAGE. 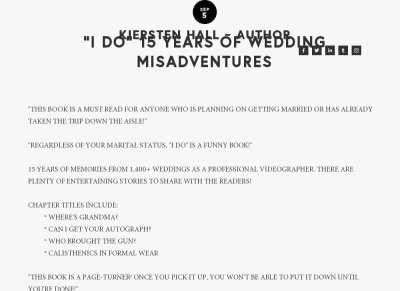 ABSOLUTELY HILARIOUS THIS IS THE STRATEGIC, GUERRILLA HANDBOOK TO PLANNING A SUCCESSFUL WEDDING. READ VIGNETTES OF I DO HERE AMAZON CUSTOMER REVIEW ITS JUST AN AWESOME PAGE-TURNER. IF YOURE GETTING MARRIED, YOU DEFINITELY NEED TO BUY IT. IF YOURE NOT GETTING MARRIEDALREADY HAVE GOTTEN MARRIED AND YOURE LOOKING FOR SOME GOOD LAUGHS, ITS TOTALLY WORTH IT. KIERSTENS STYLE OF WRITING IS ALSO JUST REALLY REFRESHING AND MAKES FUNNY STORIES EVEN FUNNIER - CRISP, SATIRICAL PROSE ELEGANTLY PUT TOGETHER. SHE TAKES YEARS OF GREAT STORIES AND BOILS THEM DOWN TO THE BEST ONES FOR THE READER TO ENJOY.